As a result of a century of engineering experience, Tsubaki launched its newest innovation – the Eighth Generation of Drive Chain Series. Tsubaki focuses on research and development in new technology and products to respond to ever-increasing industry demand. G8 Roller Chain – Offers 20% increased wear life than our G7 Series. The G8 chain offers anti-rust lubrication, our one-of-a-kind solid lube groove bushings and patented ring-coining connecting links. G8 Neptune Series Chain – Uses a new surface treatment structure that combines Tsubaki’s uniquely developed special coating and special resin coating for superb corrosion (rust) and chemical resistance. G8 Lambda Series Chain – New bushing technique was developed using new materials, density, and oil types. Tsubaki G8 Lambda Chain now uses NSF-H1 food grade lubricant. These new techniques give this chain double the wear life of the previous model and is now suitable for use with food equipment. G8 Heavy Duty Series Chain – The goal is to find ways to improve the fatigue strength without changing the dimensional properties of the chain. Super Roller Chain - 5 to 10% higher maximum allowable load (MAL) than previous series or 40% greater MAL than standard Tsubaki roller chain. Super-H Series Chain – 20% higher maximum allowable load (MAL) than previous series or 60% greater MAL than standard Tsubaki roller chain. HT Roller Chain – Twice the wear life of the previous series; slip-fit connecting link and solid bushings were introduced to this series. This is competitor’s 3.5” feeder breaker chain sample that was sent to our Technical Support Team for failure analysis. Tsubaki provided a thorough analysis and made appropriate solutions backed by a century of experience. 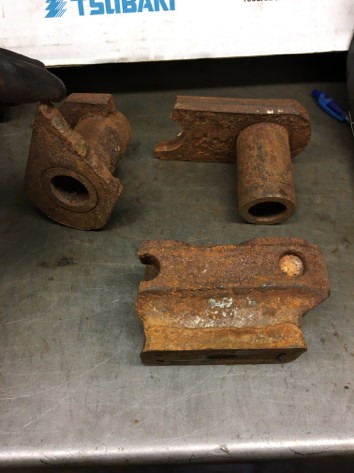 The chain was observed to be highly corroded with apparent pitting and layer of fully-formed rust penetrating all parts. One plate seemed to have rotated around a bushing and experienced a tensile fracture at the bushing hole. The sample chain was fitted with flight attachments and was used to move salt. 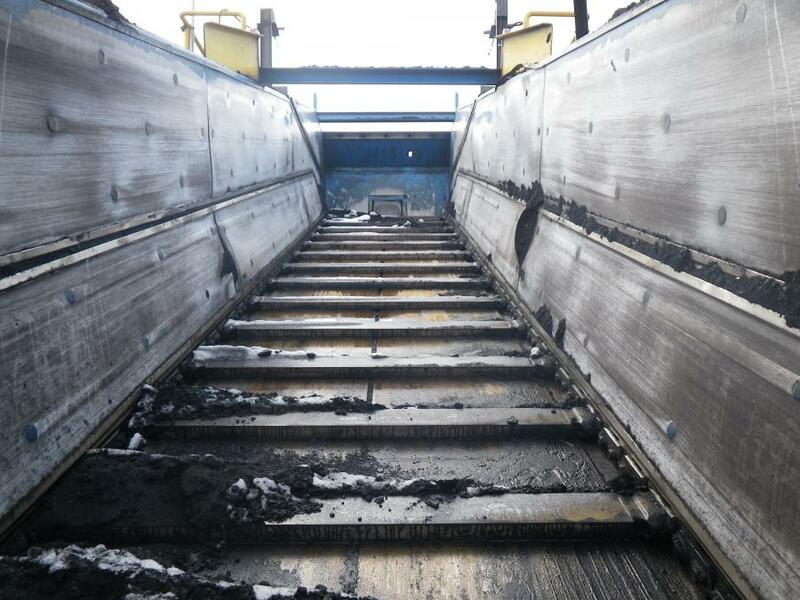 Unprotected service and contact with salt seemed to have accelerated corrosive wear and significantly deteriorated the surface of all the chain parts. The amount of corrosion present would have weakened the chain. Tsubaki recommended 3.5” feeder breaker with flight attachments and UWP corrosion resistant plating to reduce the rate of corrosion. Shock relay was also recommended, in order to prevent future part failures during an overload occurrence. For any technical issues, contact the trusted name backed with a century of experience, Tsubaki! 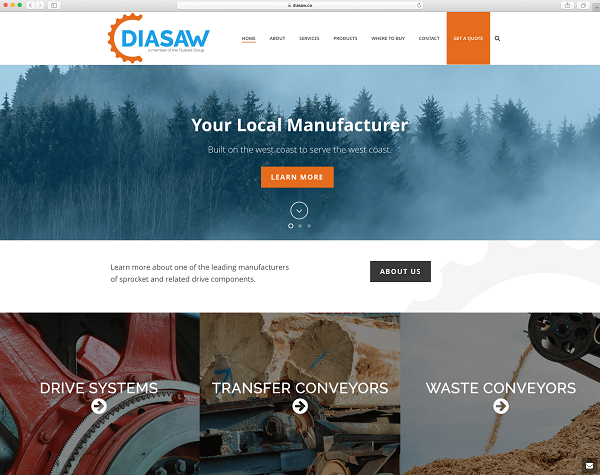 Tsubaki has launched a new website for its recently purchased company, Diasaw, located in Maple Ridge, British Columbia. Tsubaki of Canada strategized the purchase of this sprocket and related drive components company to better serve Western Canada and Northwestern Pacific USA, by providing shorter lead time and faster delivery. Diasaw is known for manufacturing quality products at a competitive price while providing the utmost customer service. The acquisition expands the breadth and depth of Diasaw's product offering backed by the Tsubaki brand. Diasaw offers a multitude of services backed with years of experience in welding, fabrication, and machining. Diasaw has a complete welding and fabrication shop offering MIG welding, stick welding, brazing, cast iron welding, plasma and gas cutting, and custom fabrication services. Diasaw also offers machining services including turning to 34” diameter, slotting up to 12” length-through-bore, keyseating, milling, drilling and tapping. Access to tooth cutting as well as profile cutting is available. Diasaw’s experienced machinists have the expertise to produce precise parts at close tolerances. Diasaw’s large inventory and on-site services enable custom orders and quick delivery times for the local market.